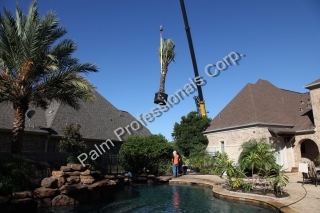 CLICK HERE To See our company transplanting the largest Medjool Date Palm (Phoenix Dactylifera var. Medjool) ever Delivered, transplanted, and installed in Texas. 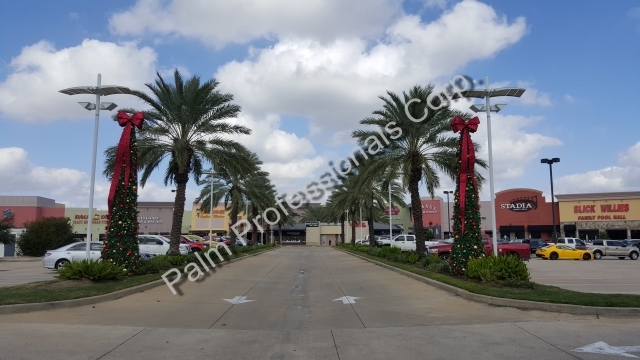 CLICK HERE To See Other Medjool Date Palm Projects Using The Palm Professionals Company. Click On Medjool Date Palm Tree This True Date Palm (Medjool) is used for focal points in tropical landscapes, commercial projects, resorts, and other locations in Texas where that "WOW" factor is wanted. The trunk of these Medjool Date Palms are hand carved, which is the reason why not too many other palm trees make a statement like the True Date. The custom cut trunk on these Phoenix Dactylifera var. Medjools is called Classic Cut or Diamond Cut. These Medjools Date Palms are becoming widely used aesthetically in all parts of the world and especially in Houston areas as well as other parts of Texas like San Antonio, Austin, and Corpus Christi. These Date Palms are very tolerant to the Texas heat and cold winters as well. This is just one of the reasons that people buy so many of these Phoenix Dactylifera var. Medjool Date Palms. People are purchasing these Medjools by the dozens every day for wholesale use, commercial projects, and even for their swimming pool areas at their homes. 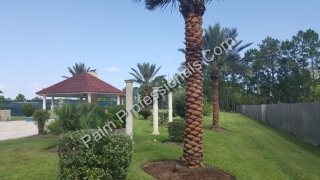 These Medjool Date Palms are so popular that we provide our services not only in Houston, but also to Austin, Dallas, San Antonio, Victoria, and many places outside of Texas where people require a Date Palm Specialist to buy Medjools from and have our expert team of specialists install these Date Palms as well. Click Medjool Date Palm Tree The fruit is known as a date. The fruit's English name (through Old French), as well as the Latin species name dactylifera, both come from the Greek word for "finger", dáktulos, because of the fruit's elongated shape. Dates are oval-cylindrical, 3–7 cm long, and 2–3 cm (0.79–1.18 in) diameter, and when ripe, range from bright red to bright yellow in colour, depending on variety. Dates contain a single stone about 2–2.5 cm (0.79–0.98 in) long and 6–8 mm (0.24–0.31 in) thick. Three main cultivar groups of date exist: soft (e.g. 'Barhee', 'Halawy', 'Khadrawy', 'Medjool'), semi-dry (e.g. 'Dayri', 'Deglet Noor', 'Zahdi'), and dry (e.g. 'Thoory'). The type of fruit depends on the glucose, fructose and sucrose content. 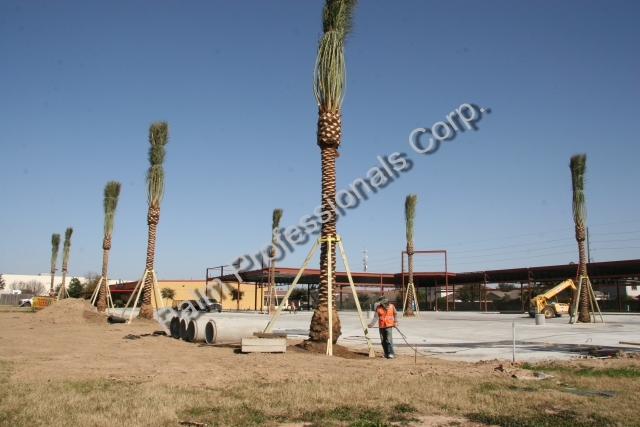 CLICK HERE To See Medjool Date Palm Projects Using The Palm Professionals Company. Click On Medjool Date Palm Tree Our Date Palm Tree Expert Team can move palm trees over the top of houses, buildings, and complete any installation that you require. These Medjool Date palms, a.k.a. 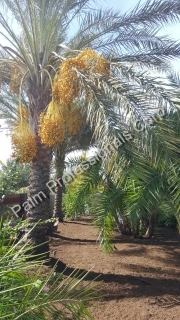 "True Date Palms", are extremely heavy and require a skilled date palm tree specialist to transplant them with success. 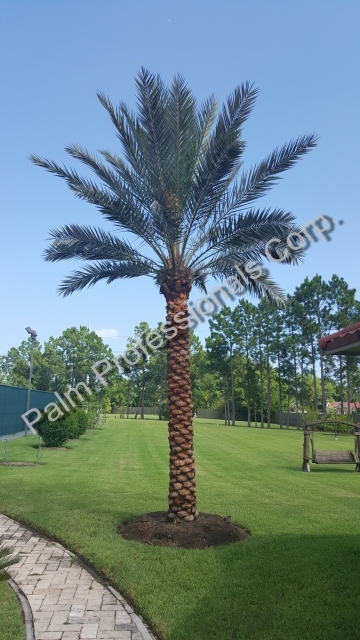 Be cautious of hiring an average landscaper or garden center to install Medjool Date Palms that may not have the palm tree skills and knowledge to handle these date palms. Unfortunately, hundreds of people purchase these date palms every year and then use an inexperienced landscaper based on the fact that the landscaper quoted the job at the lowest cost compared to an actual palm tree specialist's quotes. 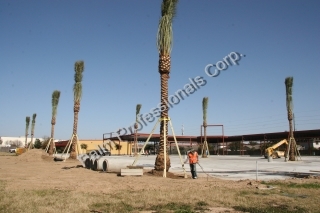 Also remember, hire a palm tree company that is familiar with your local area, climate, and soil types. 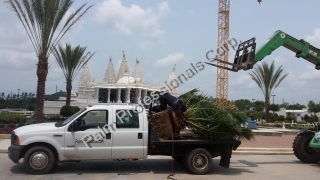 There are a number of new nurseries and landscapers showing up in Texas every year that are claiming to be palm tree specialists which are not. Especially in Houston. Some of these people selling Medjool Date Palm Trees are not even from Texas and are not educated to the Texas soils or climate. 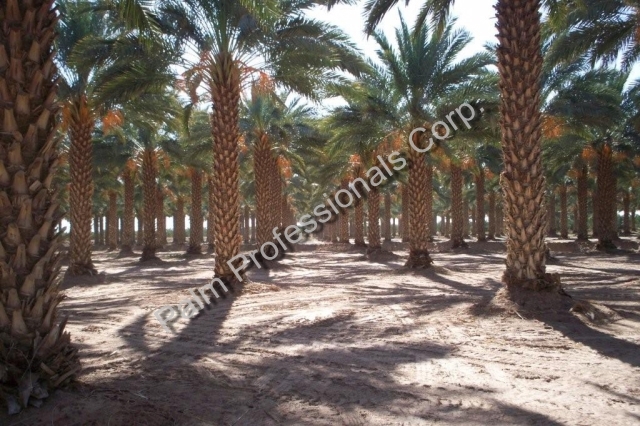 Palm Professionals Company has 3 generations of Texas growers in our family. This is why architects, landscapers, and homeowners use our Medjool Date Palm expertise and experience when they want a quality and safe Date Palm Tree and Installation. 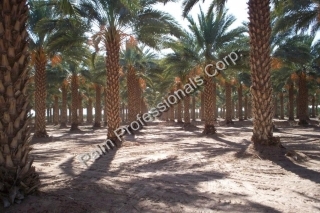 We are Date Palm Tree Growers and Medjool Date Palm Tree Specialists. 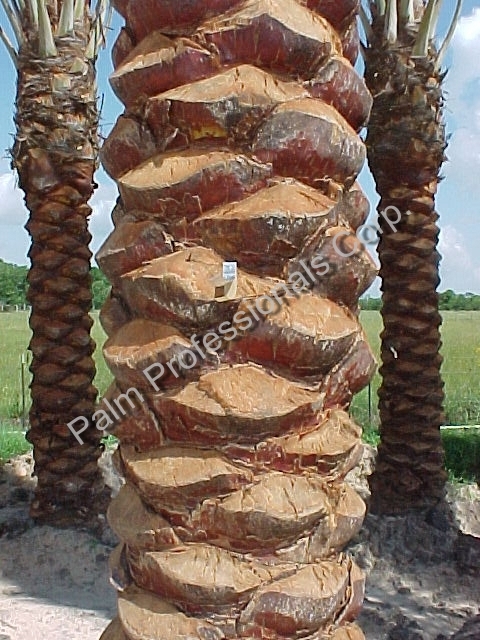 Do your research first before you buy a Medjool Date Palm Tree in Houston or other Texas areas. There are some misleading sales people and landscapers that are not qualified to handle these Medjool Date Palms. Also, there are some nurseries - garden centers claiming warranties, guarantees, and free installation that are not valid and can leave you regreting that you ever bought a Medjool Date Palm Tree...especially if it dies. 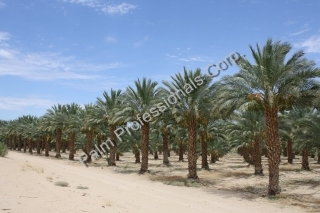 Read a company's fine print first before you buy a Medjool Date Palm Tree. Here at Palm Professionals Company, we have decades of local Houston experience as a palm tree specialist in care, transplanting, and growing Medjool Date Palm Trees and all other Palm Trees as well. 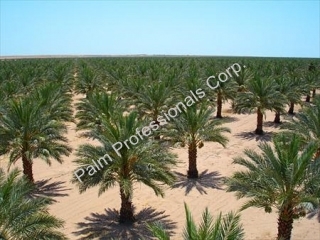 Our Medjool Date Palm Specialists are happy to answer as many questions as you would like to ask about Medjools. We have always found that a well informed customer is the best customer to work with. See Where To Buy Cold Hardy Medjool Date Palm Trees In Houston, Texas and Buy Other Palm Trees For Sale In Houston, Texas.